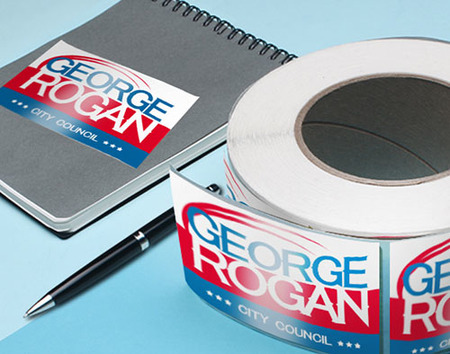 Campaign Stickers is rated 3.8 out of 5 by 4. Rated 5 out of 5 by Skigirl from Perfect for our needs! We're a new company launching our brand. This is an affoerable way to create some buzz! Thank you! Rated 5 out of 5 by Kwadjo from Campaign Stickers No hassle. Great work. Everyone loves them. And the price. You guys have a loyal customer! Rated 4 out of 5 by AMS1 from Campaing stickers I was pleased except that the box was damaged and several stickers were ruined. Rated 1 out of 5 by Truckin70 from Terrible Job My stickers arrived without gloss as ordered and were cut so poorly as to render them useless. Unfortunately, I paid so much for the expedited shipping. Very dissatisfied.